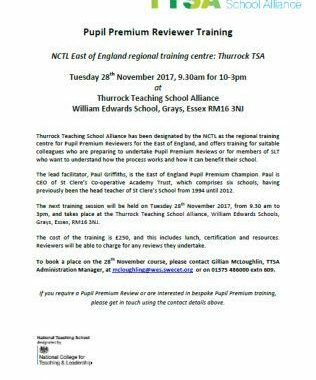 The next training session will be held on Tuesday 28th November 2017, from 9.30 am to 3pm, and takes place at the Thurrock Teaching School Alliance, William Edwards Schools, Grays, Essex, RM16 3NJ. To book a place on the 28th November course, please contact Gillian McLoughlin, TTSA Administration Manager, at mcloughling@wes.swecet.org or on 01375 486000 extn 609. If you require a Pupil Premium Review or are interested in bespoke Pupil Premium training, please get in touch using the contact details above. Tagged pupil premium, reviewer, training.